The State’s Water Quality Rapid Response Team, co-chaired by DEC Commissioner Basil Seggos and DOH Commissioner Howard Zucker, will convene four Regional Summits to bring together nation-leading experts with Steering Committees of local stakeholders established for each lake. The Rapid Response Team, national experts, and local stakeholders will collaboratively develop Action Plans to identify contributing factors fueling HABs and the state will provide $500,000 per lake to develop immediate action plans to reduce sources of pollution that spark algal blooms. The state will provide nearly $60 million in grant funding to implement the Action Plans, including new monitoring and treatment technologies. This initiative will bring together leading researchers from across the nation, including experts from Michigan, North Carolina, Ohio and Vermont, as well as the SUNY Collegeof Environmental Science and Forestry, SUNY Stony Brook Center for Clean Water Technology, the New York State Soil and Water Conservation Committee to share best practices and develop innovative solutions that can be replicated in water bodies across the state. 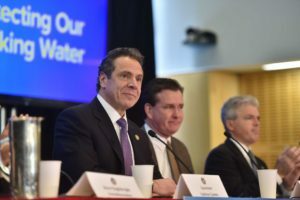 The announcement builds on the State’s $2.5 billion Clean Water Infrastructure Act investments in clean water infrastructure and water quality protection. Through Governor Cuomo’s leadership, New York has developed the most comprehensive HABs outreach and monitoring programs in the country, led by DEC sampling ambient waters across the state and Department of Health sampling at regulated beaches and public water systems.